Someone you know needs a writer right now. If you want that freelance writing job, you must get in front of that person. Look around you. Advertisements, brochures, websites, television commercials, promotional videos, instruction manuals, books, and email newsletters—writing is everywhere. Proof is everywhere. Millions of companies and individuals desperately need your skillset at this very moment. The demand for writers is obvious to anyone who drives down the street and sees a thousand signs, billboards, and storefronts. Business is simple. If you have one client, you are “in business.” The rest is lather, rinse, repeat. Admittedly, managing and growing your business involves a learning curve. So did driving a car at sixteen. So does cooking chicken tikka masala. Setting up your legal entity and preparing your taxes may make your head hurt and your eyes go crossed, but if you can drive a car and cook a palatable tikka masala, then you can figure out Business. Perhaps this metaphor will help you: The business of freelancing is a scavenger hunt. You must follow the clues to locate the prize. Only the people who persist find the prize, which in this case is getting paid to write. How long will you keep trying before you give up? Persistence is the rather boring secret to success. Stick with freelance writing long enough, and odds are, you’ll accumulate enough clients to make it a full-time gig. Each client is a building block, and as you focus on the next one, start with the individuals and business owners you already know. Someone you know needs a writer right now. So look for clues. Which of your friends, family, and acquaintances are looking for new jobs? You could brush up their resumes and either create or refine their LinkedIn profiles. Who is starting a new business or launching a new product or service? Scan their social feeds. People often drop hints that they need a writer. Which businesses and companies show up in your inbox? Better yet, which ones only pop up every once in awhile? Inconsistent email marketing is a potential feast for the hungry freelance writer. Most people want to stay consistent with digital marketing tactics—social posting, email marketing, and blogging—but other tasks and responsibilities eat up their time and attention. Assume that people need what you have to offer, but that the onus is on you to help potential clients articulate that need. Someone you know needs a writer right now. What are you going to do about it? 1. Set a goal. How many new clients do you need? 5? Not all prospects will become clients, so how many new prospects do you need? 20? Start with 20. If you’re able to sell a project to more than 25% of your prospects, then kudos. Better to oversell and farm out work to other freelance writers than to undersell. In fact, overselling and farming out the surplus is the counterintuitive way to grow your writing business. 2. Think back on recent conversations. Did anyone express interest in working for you? Did you send out quotes and forget to follow up? Have you failed to keep in touch with any past clients? Add all those prospects to your list. 3. Next, cruise your Twitter, Facebook, and LinkedIn feeds. What clues you can find? Writing is the grease that makes the business machine work smoothly. All business owners need writing. 4. Peruse your inbox. Which companies you like are clearly active with email marketing? Which ones have great content? Which ones have forgettable or cringeworthy content? Companies that send emails consistently value high-quality content. It’s usually easier to sell to clients who already place high value on what you do. As for the companies with weak content, they are probably aware of the quality gap. Get in touch. Tell them you love what they do, and you’d like to get involved with their email marketing. 5. Keep track of clues and update your list of prospects as you go. 7. Keep track of these prospects and conversations in a Google Sheet or in a free Highrise account. 8. Follow up. If you don’t already have a good system in place, then read this post on following up without being annoying. 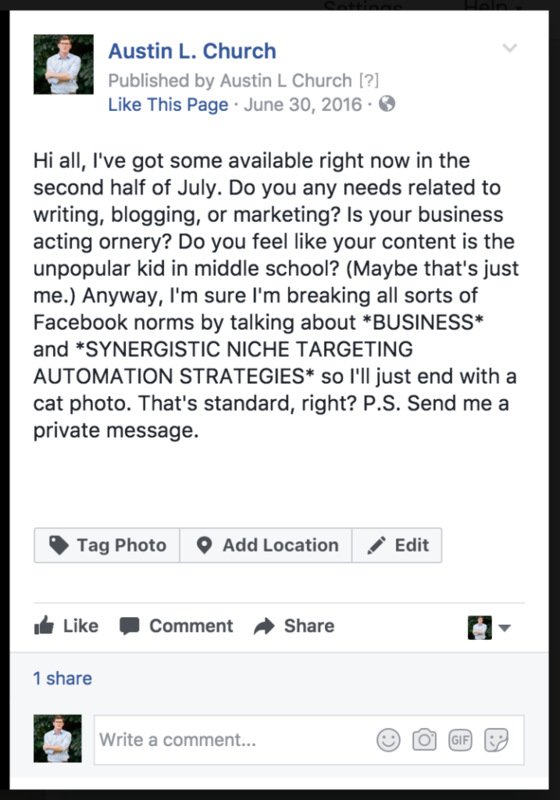 Word to the wise: Make at least nine educational posts for every one promotional post. 10. Keep following up every six weeks to three months. Your freelance writing business won’t be built in a day. Follow up to stay top of mind. Human beings are strange creatures. We often misdiagnose our own problems, and we sometimes have to venture deep into a desert before we recognize dehydration. Your would-be clients know how to write, and they plan on getting around to that new web content eventually. Unfortunately, higher priority tasks keep pushing “write new company page” down their to-do lists. Maybe Dave has finished them, but more often than not, he has done nothing. Without aggravating Dave, you can gently but firmly point his attention to a reality he’d rather ignore: He has unfinished writing projects. They have been in his queue for awhile. Wouldn’t it be nice if someone else made that problem disappear? Someone you know needs a writer right now, but that the onus is on you to help potential clients articulate that need. Let me address an elephant in the room. Many freelance writers feel weird about asking friends, family, and acquaintances for work. After all, we have to see these people at church and dinner parties; at Christmas and at the local coffeeshop. With that said, they’re also the people who know, like, and trust us. They are the people most likely to hire us! So I encourage you to treat the personal network you already have as your potential client base and referral network. Go get in the way of opportunity, and stay top of mind. That way, when friends, family, and acquaintances need a freelance writer, you will be the first person that comes to mind. Let me show you how this looks in action before I tell you about a freebie. In June 2016 I posted this update on my Austin L. Church Facebook page. In June 2017 I posted this update on my personal Facebook profile. The June 2016 post resulted in… nada. The June 2017 post got me a small $750 project that involved updating a guy’s resume. The reason I think the 2017 post is better is because I mention specific problems that my skills solve. In fact, I made a video about that. If you find an email template that works, keep using it! Earlier I mentioned a freebie. I doubt I have to convince you that follow-up is important. If you’ve ever emailed a past client at just the right time and gotten a new writing project with almost no effort, then you have experienced firsthand the addictive nature of repeat business. 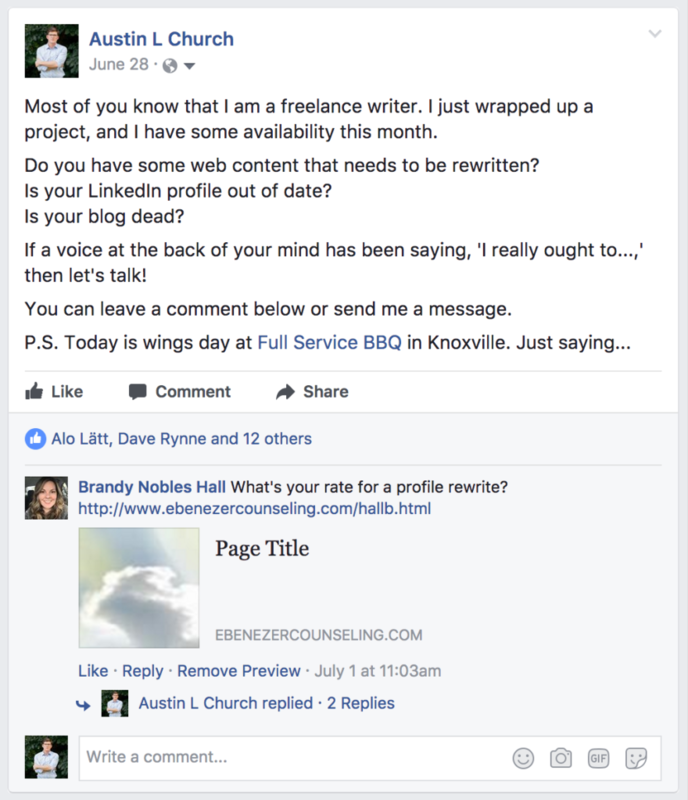 So why don’t more freelance writers get more repeat business and referrals? Because they either forget to ask or they don’t know how to ask without coming across as tacky or needy. We don’t want to ask for too much too often, so we ask for too little too late. For me the solution was developing the right tactful language that is consistent with my idea of professionalism. I now feel comfortable asking because I trust these templates. They work. They have gotten me new business without weirding out my clients and other people in my network. One last piece of advice: Always look for ways to simplify your business. If you find an email template that works, keep using it! Someone you know needs a writer right now. The trick is getting in front of that person. If you want my four templates and the cheatsheet that explains how to use them, then enter your name and email address below. I’ll email you the download link.